HONG KONG – At a special welcome party in the park, Hong Kong Disneyland Resort (HKDL) today proudly introduced a new Disney character named Cookie, the newest friend of Duffy. More than three hundreds fans from all around the world cheered in excitement as they meet this adorable new friend of Duffy at her global debut at HKDL. Cookie is a girl puppy who is inventive and resourceful, particularly when it comes to food. With her signature beautiful eyes and long floppy ears, Cookie charms her fans with her passion for delicious recipes to delight and amuse. This food lover, in a chef’s hat with a cute pink bow, is the very best of friends with Duffy, ShellieMay, Gelatoni and StellLou. Starting from today, guests at HKDL will be the first to meet Cookie in person at “Main Street Cinema: My Journeys with Duffy – Presented by Fujifilm.” HKDL is also proud to offer exclusive merchandise items celebrating her arrival, including desserts and other snacks inspired by Cookie herself and her creative recipes. Duffy first met Cookie along Main Street, U.S.A. while he was about to enjoy some delicious cotton candy. He accidentally bumped into Cookie who was carrying a huge stack of waffles and all their treats flew into the air! Luckily, Cookie caught them, which inspired her to turn the ingredients into a cotton candy waffle sandwich. The accident turned out to be a recipe for friendship! 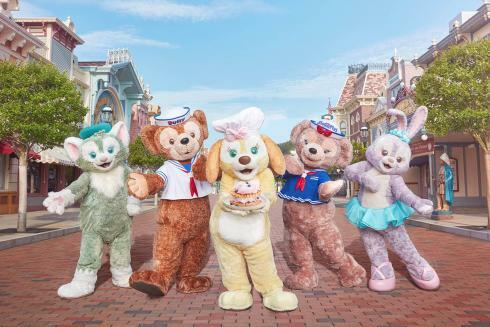 Every day, a special arrival moment to welcome Cookie will be staged in front of “Main Street Cinema: My Journeys with Duffy.” After that, guests will be able to meet Cookie in person there and learn her new ideas about food!